Home » Posts Tagged "primary"
Click to view and download recommended candidates list. In this edition of Under the Dome, we share with you our recommendations for the August primary elections. When you see them, you’ll probably be wondering about the race for Kansas Governor or the Congressional races. Two of the congressional races are listed, but two are not and there is no recommendation in either the Republican or Democratic Gubernatorial races. There’s actually some good news at least for some of these races. So let me take this column to explain our thinking! 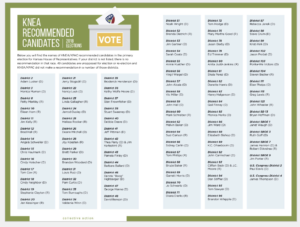 KNEA does not have a recommendation for the Democratic Primary. The reason is simple. The Democratic candidates have completed and returned questionnaires to KNEA and no one candidate stood higher than the others on our issues. Every Democratic candidate for Governor is a strong supporter of our public schools, our students, and all our school employees. 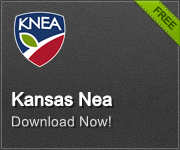 Additionally, the two candidates who served in the Kansas Legislature – Senator Laura Kelly and former Representative Josh Svaty – both had excellent legislative voting records on issues of importance to KNEA. The race would appear to be a tight one between Kelly and Svaty. Former Wichita Mayor Carl Brewer also enjoys significant support. Public schools, our students, and Kansas educators would be well-served by any of these candidates and we are hard-pressed to elevate one above the other. We urge our Democratic members to look closely at all these candidates and consider their positions on public education as well as their individual positions on issues of importance to each of you personally. And as you cast your ballot, consider yourself lucky to not have a bad choice when it comes to supporting public education. As for the Republican Primary, it would seem that only one candidate has any interest in being considered by KNEA – Jim Barnett. Barnett is the only Republican to return a questionnaire to KNEA and his questionnaire reflects general alignment with KNEA positions regarding public education. Barnett has also continued to reach out to teachers and KNEA members throughout his campaign – including contacting and meeting with KNEA local affiliates and UniServ Councils – seeking their input and sharing his perspectives. While his KNEA voting record as a State Senator was not stellar, he appears to have studied the issues more closely and adjusted his positions in his time out of the Legislature. Unfortunately, Barnett’s candidacy is an extreme longshot while Governor Colyer and Secretary of State Kobach go head to head for the nomination. We know where Colyer and Kobach stand on some issues thanks to reports in the press. Here, for example, both the Colyer and Kobach campaigns express support for private school vouchers and tuition tax credits. In speaking to the Wichita Pachyderm Club, Kobach again expressed strong support for vouchers, in addition to reductions in education spending and grading schools A through F. The Wichita Eagle opined on this back in May. Republican educators need to understand that only Jim Barnett was willing to participate in our recommendation process. Colyer and Kobach have stated positions contrary to KNEA positions on a number of issues and we have no confirmable information on the positions of other Republican candidates. Jim Barnett submitted a questionnaire and has held a number of press conferences and press releases that indicate strong support for public education, children, and educators. Click Here to view the recommended candidates list. Steven Becker, HD 104, is a Write-in Candidate! 25% of Kansas Voters Set to Determine Your Future!